Written in the 1980s at the height of Thatcher’s Britain, Alan Moore’s V for Vendetta is a politically charged graphic novel set in a dystopian near-future world in which Britain has fallen into fascism following a brief nuclear exchange. 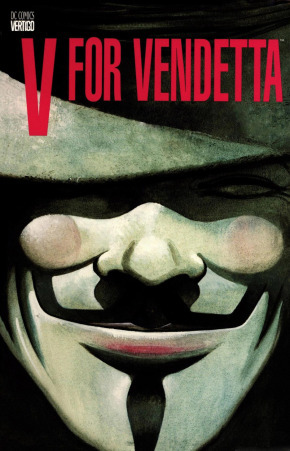 The plot follows a victim of concentration camp experiments, the deranged anarchist anti-hero in a Guy Fawkes mask that calls himself ‘V’, as he seeks to bring down the government through acts of terrorism. In a society that promotes homogeneity and discourages free thinking, the revolutionary underpinnings of V’s agenda are signalled through his personal theatricality and appreciation for the arts. The collection of cultural artefacts in his “shadow gallery”, his use of quotations from high and low culture, and his adoption of music and drama to his cause underscore his humanitarian impulses, while his explosive methods and hubristic self-aggrandisement complicate his morality. The part that music plays in this graphic novel is as ambiguous as V’s personal ethics. It is both a clarion call for individuality, humanity, and revolution, and, disturbingly, a smokescreen for the dark deeds V deems necessary to achieve his aims. by means of such surveillance, disciplinary power became an integrated system […], although it is true that its pyramidal organization gives it a ‘head’, it is the apparatus as a whole that produces ‘power’ and distributes individuals in this permanent and continuous field. This enables the disciplinary power to be both absolutely indiscreet, since it is everywhere and always alert […] and absolutely ‘discreet’ for it functions permanently and largely in silence. In such a society, ‘visibility is a trap.’ The significance of V’s mask and his hidden identity–‘I don’t have a name. You can call me “V”’–is, therefore, not only to be found in its operation as a symbol on which the stirrings of revolution can be built, but also in its active rebellion against the various structures of power within the surveillance state. As what post-structuralists would call a free-floating signifier, the name ‘V’ is dangerous, anarchic, and not easily controlled. Moore exploits the proliferation of meanings that can be attributed to the name ‘V’, from Victory to Vaudeville. The shifting symbolism of V’s mask allows him to be both victim and villain, saviour and destroyer. The potentialities behind V’s ambiguous name extend to the central musical theme of this graphic narrative: Beethoven’s Fifth Symphony. Sometimes referred to as the victory symphony, this work has also accumulated a large, if largely coincidental, set of cultural interconnections. As well as being known as the victory symphony, the rhythms of the opening phrase, as Alan Moore tells us in V for Vendetta, would also become used for the letter ‘V’ in Morse code. The paranoid logic of these interconnections no doubt appealed to Alan Moore when he was writing V for Vendetta, but this is only one layer of the significance this particular piece holds for Moore’s narrative. The Fifth Symphony is a work steeped, historically and musically, in revolution, and it is this very spirit that V’s character calls upon throughout his narrative. lived in ultra-conservative Vienna, where any political message had to be encrypted. He was a great admirer of Luigi Cherubini, a composer of Italian origin who lived in France; and the famous theme that opens this symphony is derived from Cherubini’s revolutionary Hymne du Paanthéon of 1794. Its rhythms and even the melodic outline, to some extent, lurk in the background of this symphony. Chenier’s words for that piece were overtly revolutionary – ‘We swear, sword in hand, to die for the Republic and for the rights of man’ – and it was a heck of a thing for a German composer to encode, in a symphony without words. If this had come out into the open in a city as incredibly reactionary as Vienna, he would have been incarcerated, there’s no doubt about it. Imperceptibly, there comes another political motto, a reference to Rouget de Lisle’s Hymne Dithyrambique, specifically the phrase ‘Chantons la liberté’. It emerges gradually in the bass-line, passing to the trombones and the bassoons, and then to the violins. Then the whole orchestra is singing a hymn to liberty. What instrumental work of Beethoven testifies this to a higher degree than the immeasurably noble and profound Symphony in C minor? How this marvellous composition carries the hearer irresistible with it in its ever-mounting climax into the spirit kingdom of the infinite! What could be simpler than the main motive of the first allegro composed of a mere rhythmic figure which, beginning in unison, does not even indicate the key to the listener. The character of anxious, restless longing which this portion carries with it only brings out more clearly the melodiousness of the second theme! The ‘anxious, restless longing’ Hoffman identifies, falls into place with Gardiner’s later analysis of the piece, and highlights an atmosphere of potential energy within the composition of the kind most suited to V’s aims. V’s own brand of political anarchy is deeply connected to the theatrical, the dramatic, and the musical. The grandiosity of Beethoven’s Fifth would certainly appeal just as much to V’s aesthetic sensibilities as to his political aims and motivations. As James R. Keller notes of V: ‘his aestheticism distinguishes him from his antagonists, and his cultural treasures constitute the phoenix egg from which the (re)emergent, reconstituted, and rehabilitated culture will emerge.’ Set against the restrictive culture of the surveillance state, V’s ‘shadow gallery’ offers a window into a better, and a necessarily more artistic and culture-driven world. His collection of artefacts from both high and low culture demolishes such binary value systems, promoting instead a postmodernist sense of free play. For V, anarchy and culture, by which I mean all culture, from Beethoven to Bette Davis, go hand in hand. The theatrical, the musical, the artistic, is the very stuff of life. It is for this reason that the shadow gallery exists. The varied and clashing artefacts of culture are the very things that V believes will allow for a better society to be rebuilt when his role as destroyer is complete. As a character, V is charismatic and interesting, but also unpredictable, violent, and dangerous. He is at the very least morally ambiguous. Are his reasons for carrying out this vendetta purely selfish? Is there a better way to go about achieving his desired ends? And are those ends even desirous? These questions remain persistently in the background of the graphic narrative. But what is interesting about V’s questionable methods are the ways in which they become to some extent humanised, sympathetic, and relatable through his appropriation of the arts. More interesting than that, though, is the way in which V incorporates music and the revolutionary power of sound into his campaign of terror against the fascist state. V recognises the importance of sound, and the importance of the one voice turned into many: ‘noise is relative to the silence preceding it. The more absolute the hush, the more shocking the thunderclap. Our masters have not heard the people’s voice for generations, Evey…and it’s much louder than they care to remember.’ In exacting his vengeance on society, and inciting the populace against the government, V utilises many artistic forms, including music. The primary instance of Beethoven’s Fifth appearing diegetically within the narrative is during V’s murder of the paedophilic priest. During this period in the action, V plays the music on top of their conversation so that it cannot be properly heard by the ‘ear’, before forcing the priest to eat a poisoned communion wafer. The use of Beethoven as a cover from the prying ears of government surveillance plays into the revolutionary and political messages that Gardiner identifies in the work itself, and reveals a larger, and darker, connection between culture and resistance. Perhaps the most explicit example of this connection is to be found in V’s carefully planned terrorist attacks on the body politic, which he quite literally conducts from a rooftop overlooking London in a series of four panels on successive pages that show V waving his conductor’s baton over the city as various bastions of state power are brought to their knees. The use of Beethoven’s symphony as an intertext within Moore’s work operates on a number of levels; as one cultural artefact among many, as a way of underpinning the ambiguities and shifting significations of ‘V’ as a name, and most importantly of all, as a revolutionary call to arms. The initial coincidences that support the inclusion of this work are soon outstripped by the deeper significances of the piece itself and its connection to the underlying themes and preoccupations of the graphic narrative, and of V’s agenda. Foucault, Michel. Discipline and Punish: The Birth of the Prison. St Ives: Penguin, 1991. Print. Gardiner, Sir John Eliot ‘Beethoven’s Symphony No 5, introduced by Sir John Eliot Gardiner’ in Gramophone Oct 2014. Web. Hoffman, E. T. A. ‘Beethoven’s Instrumental Music’ Translated from E. T. A. Hoffman’s “Kreisleriana” with an Introductory Note by Arthur Ware Locke,The Music Quarterly, Vol 3, No. 1 (Jan, 1917): 123-133. Web. Keller, James R. V for Vendetta as Cultural Pastiche: A Critical Study of the Graphic Novel and Film, North Carolina: McFarland, 2008. Print. Moore, Alan. V For Vendetta. New York: DC, 2005. Print.